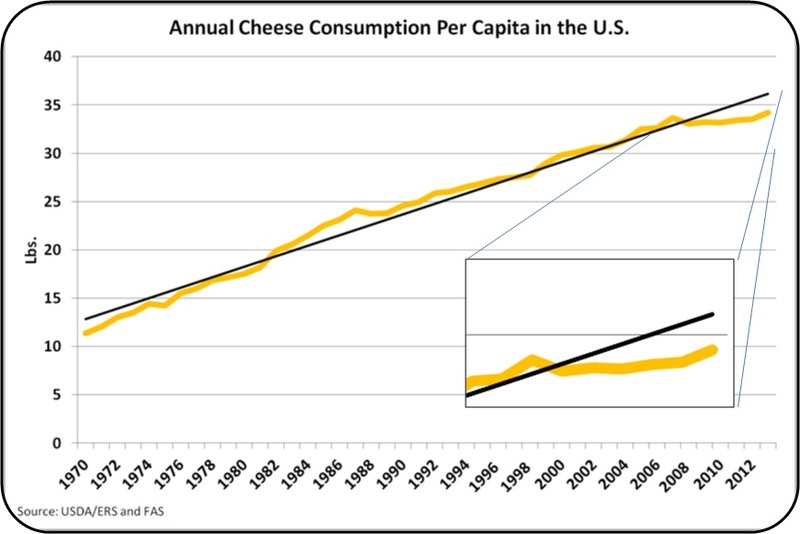 Cheese inventories are currently too high. Why are they too high? 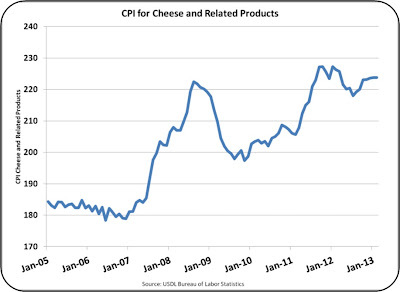 See the special section below detailing per capita consumption and retail cheese pricing. 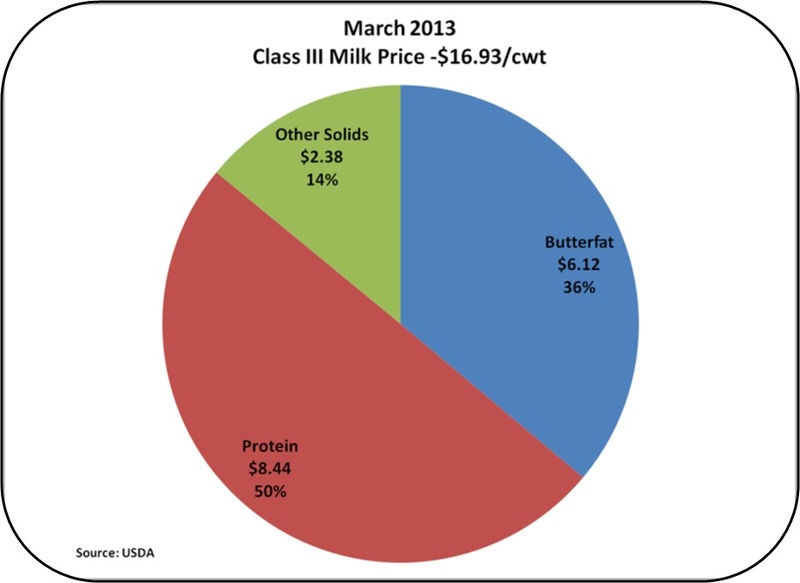 The price changed, but the split of the $16.93/cwt among components was normal with 50% of the milk check composed of revenue from protein. The long term trends for component pricing are not significantly changed. 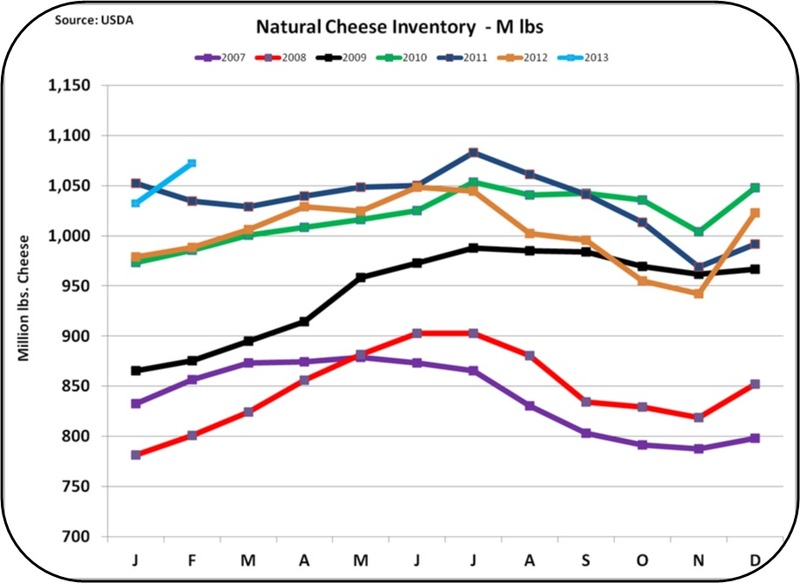 As analyzed later in this post, the inventories of Cheese, Butter, and Dry Whey were all higher at the end of February. Any real recovery in component prices will depend on a reduction of these inventories. 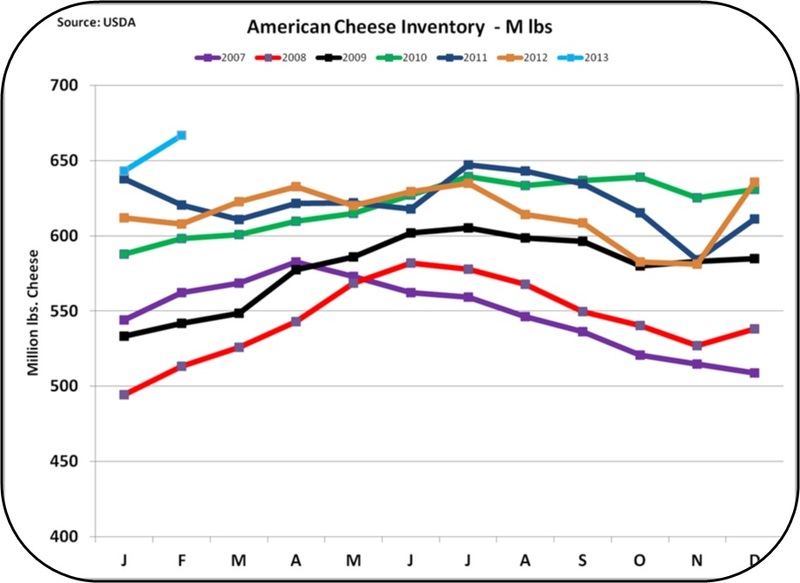 Cheese Inventories at the end of February increased significantly. 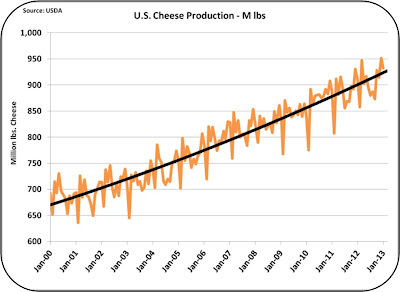 Both Natural and American cheese inventories were the highest ever for the month of February. 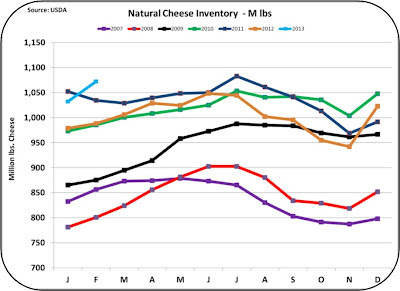 These high inventories will have to be reduced before any increase in the cheese price can be expected. 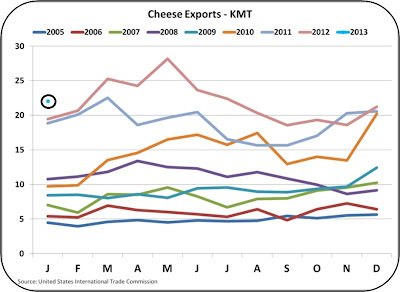 Cheese Exports were up over the prior year in January, which is the most recent data available. The export programs are performing as planned and exchange rates in the first quarter of 2013 have remained stable. The exports were 5% of production, similar to prior months. Production is not out of line based on historical growth as seen below. Production continues to increase to meet the increase in expected demand. That leaves a situation that should not have growing inventories. What is happening? See the section below on domestic consumption. U.S. domestic consumption of cheese and cheese products has shown a steady increase for over 40 years. The per capita consumption has been the driver and it is still well below European levels, so the growth has been expected to continue. Starting in 2007, there was a softening of that growth. There was still some growth, but it was much slower than the long term trend. 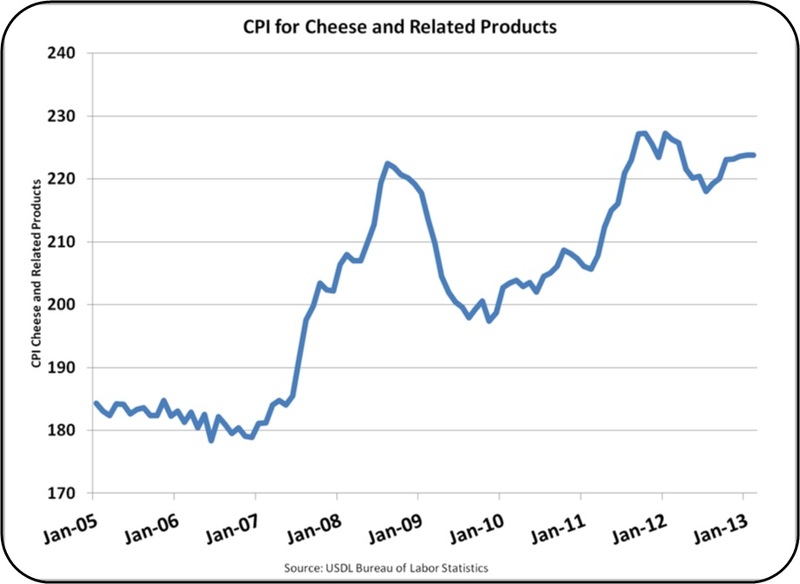 Two things happened in 2007; the U.S. recession, and increased retail prices for cheese. Pricing took a 20% jump between 2007 and 2009. Although there was some easing of prices in 2010, retail prices continued climbing, especially in 2012. The early data for 2013 shows a leveling (no decrease) in retail prices, but these early numbers are also subject to change. The conclusion seems to be obvious. The main driver of milk prices in the U.S., cheese, has taken a hit. In the long term, this can create two changes which will impact Class III milk prices. 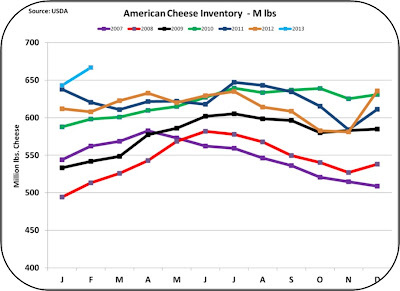 The drop in demand for cheese has increased inventories and depressed the cheese price. 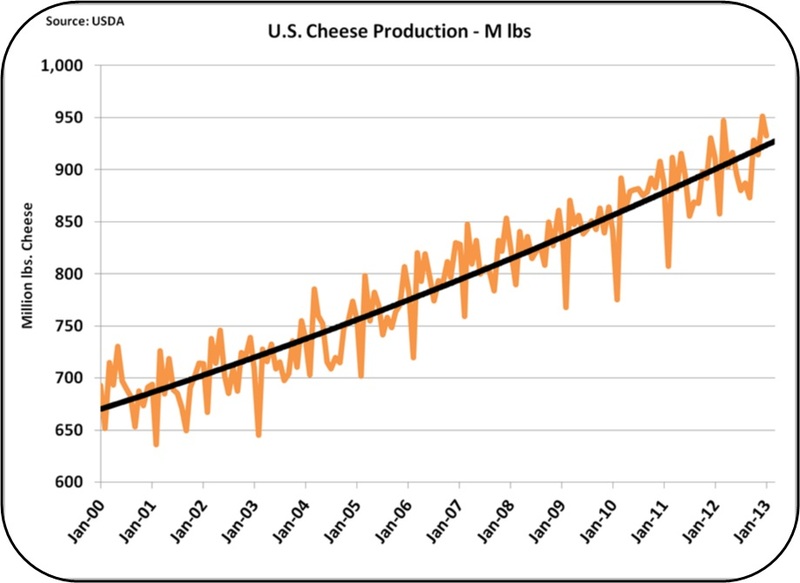 Production of cheese will have to be reduced. When this happens, the supply of whey will also decrease. 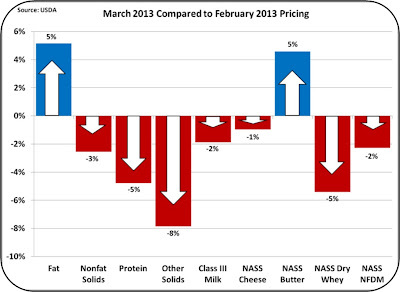 With these reductions in supply, prices for cheese and dry whey will improve. This will positively impact both milk protein and other solids prices, and increase the Class III milk price. 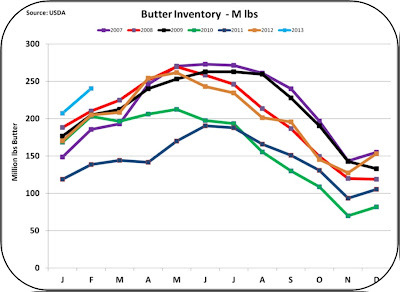 Butter Inventory continued to increase in February. 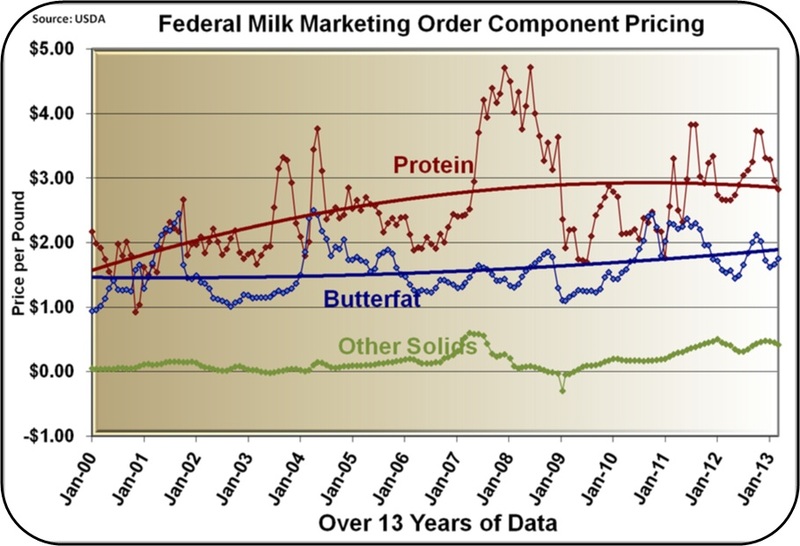 It is unusual for the price of butter to increase when inventory is high and getting higher. However, the market is not entirely rational. 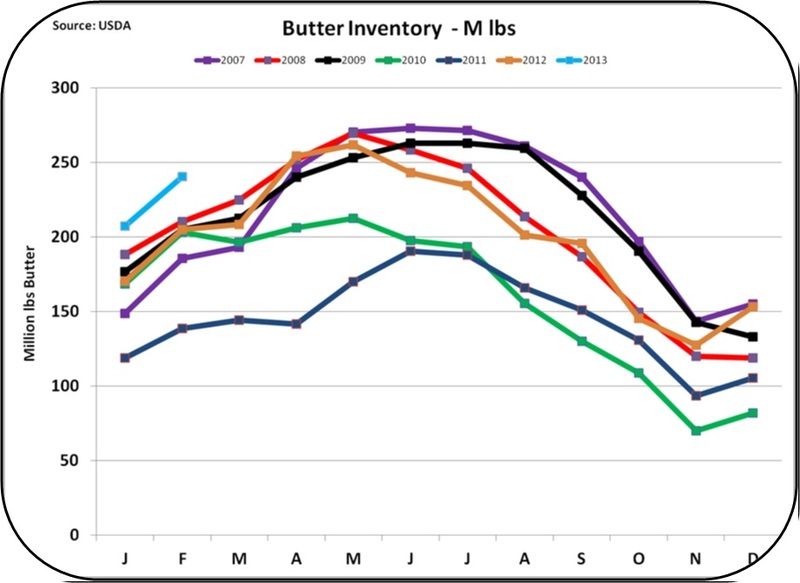 Inventories went up nearly 20% which was more that the normal seasonal fluctuation, and the price of butter increased 5% from $1.54/lb to $1.61/lb. The futures prices are going even higher. 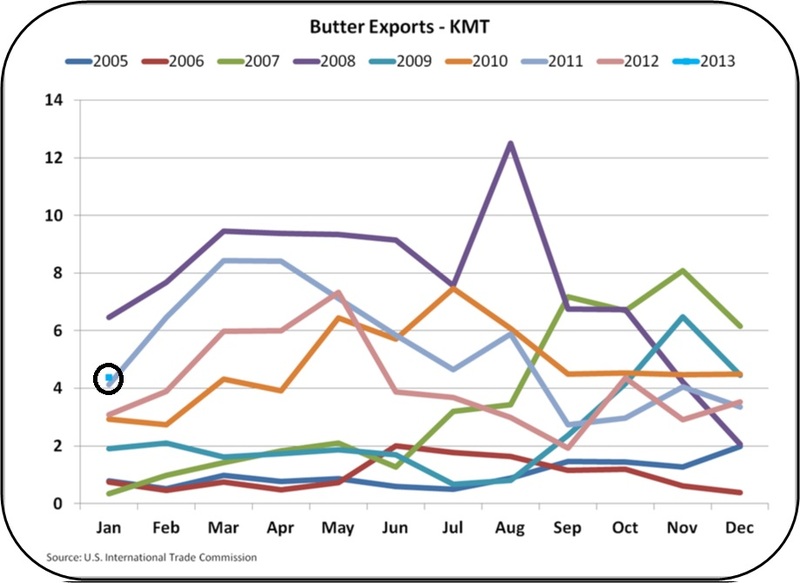 Butter exports are slightly over 2012 levels, but historically, they are not high. 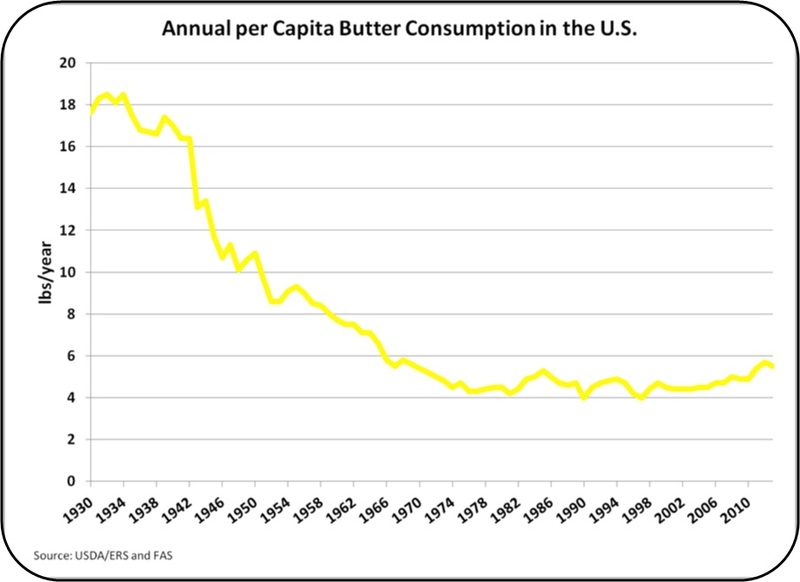 Per capita domestic consumption of butter is up slightly after a 30 year flat run. The current price for butter seems unsustainable. 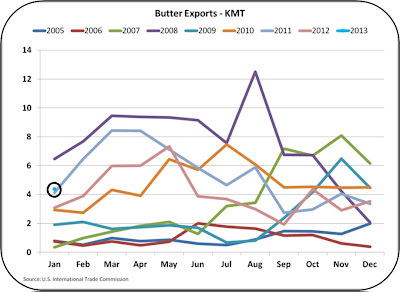 However, futures prices for butter are showing strength, so the current price may stay the same or even increase in spite of the high inventories. 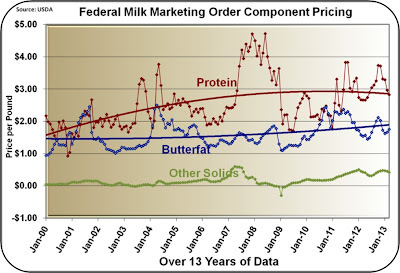 Dry Whey is the basis for the pricing of other solids. 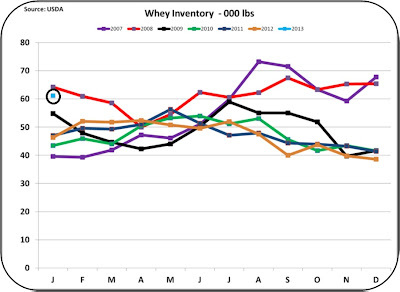 Inventories did take a jump in January and with that there was a price decline of 5% from $64/lb to $61/lb. As a result other solids lost value, falling 8% from $.45/lb to $.42/lb. 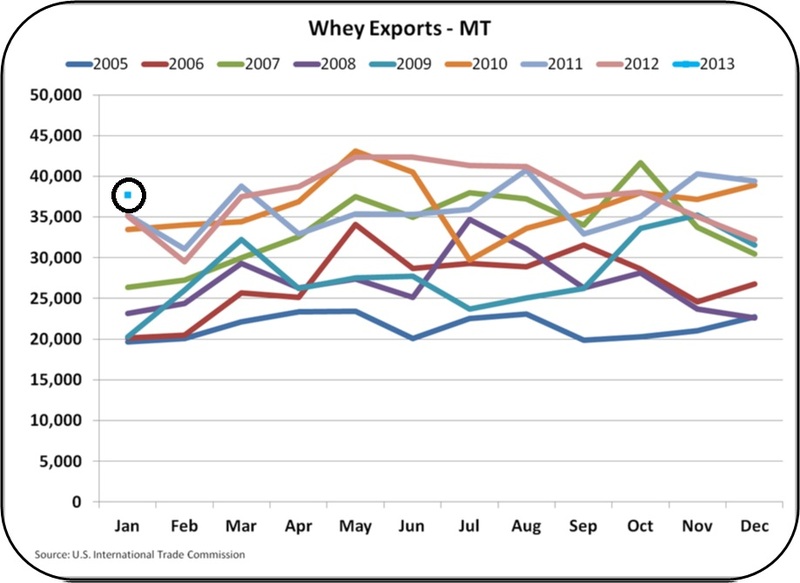 Dry Whey has been in short supply and higher prices have resulted. This was quickly reversed in one month! 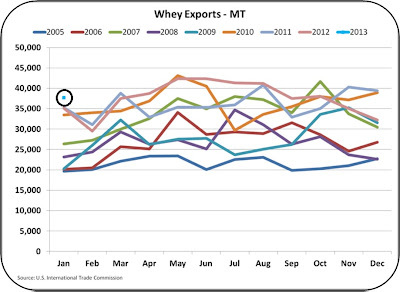 January exports remained high, above the 2012 level for January. 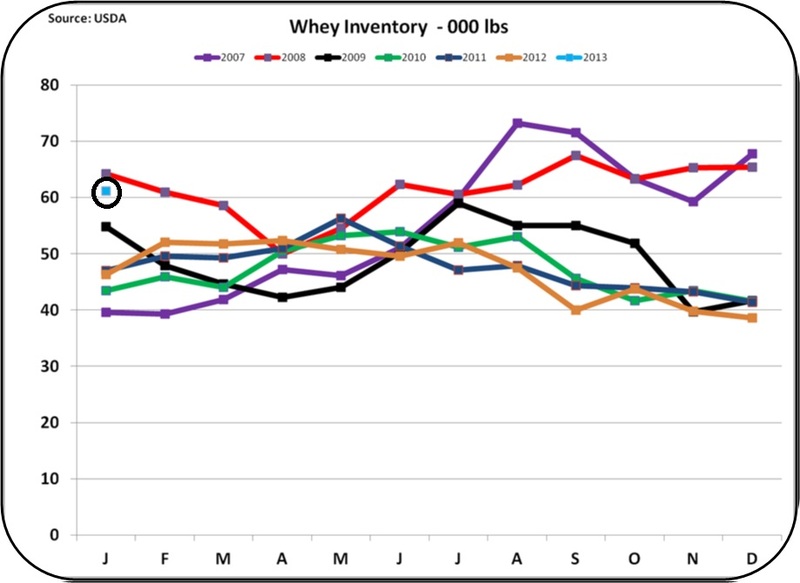 Dry Whey has been in great demand, out stripping availability. The unusual jump in inventory will take another month or two to play out. 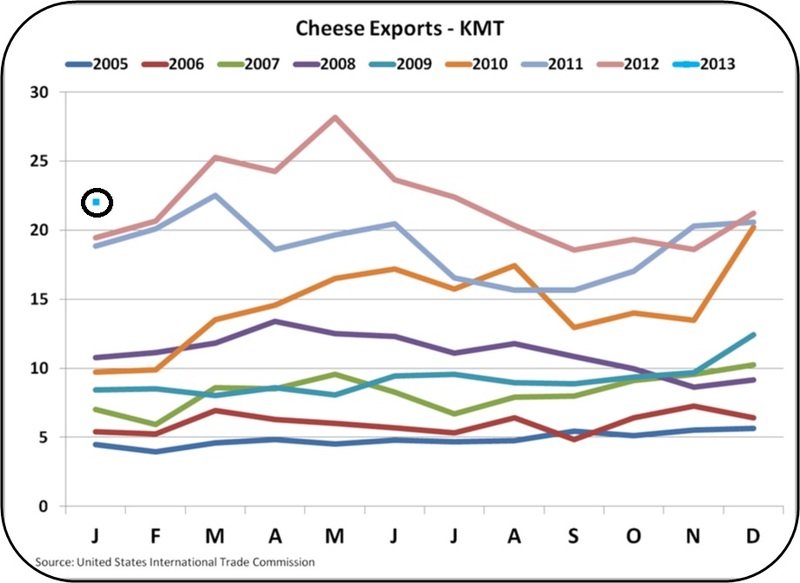 If cheese manufacturing is reduced, this will also reduce the availability of whey and help reduce inventories.